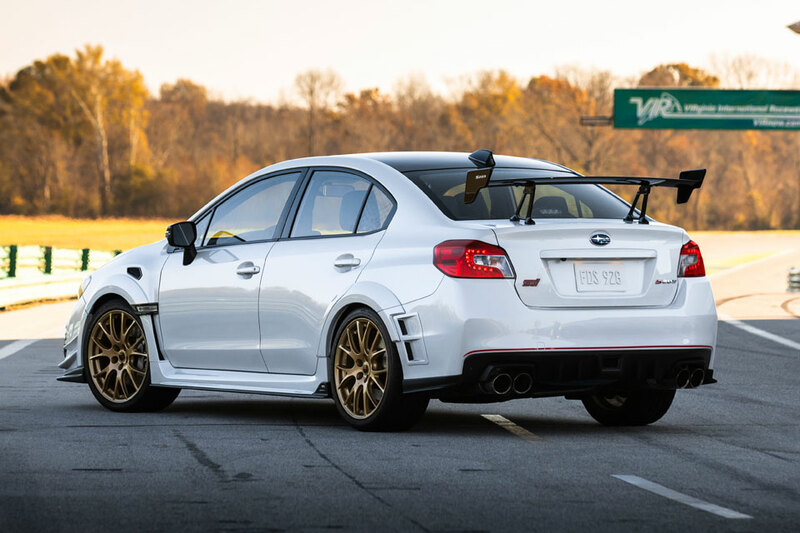 Japanese imports lovers residing in stateside, rejoice. 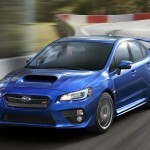 Yet another Japanese performance ride is hitting up U.S. 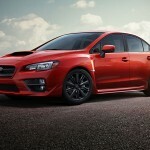 This time, it is the STI S-line. 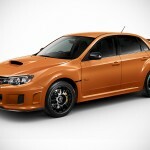 Yes, it is a Scooby. 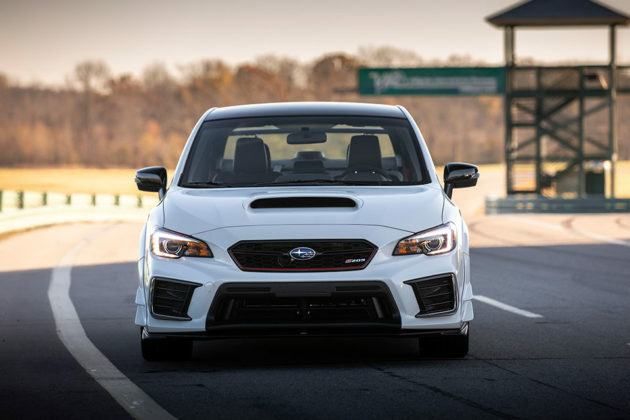 It may not look like much, but the Subaru STI S209 has some pretty raw power – all 341 horsepower of it squeezed from its EJ25 flat-four engine. As some Subaru fans may have already noticed, the Subaru STI S209 is, in fact, based on the automaker’s WRX STI, but boasts specially tuned components, including engine and chassis, along with exclusive parts on the outside and inside. With the S209, it gets higher airflow by the way of a high-flow air intake system, comprising of an exclusive, larger diameter intake duct and induction box with conical air filter, feeding air into yet another exclusively designed hardware: a turbocharger with a larger turbine and compressor. Exhaust also gets an upgrade too, via high-performance mufflers with larger exhaust tips to decrease airflow resistance. 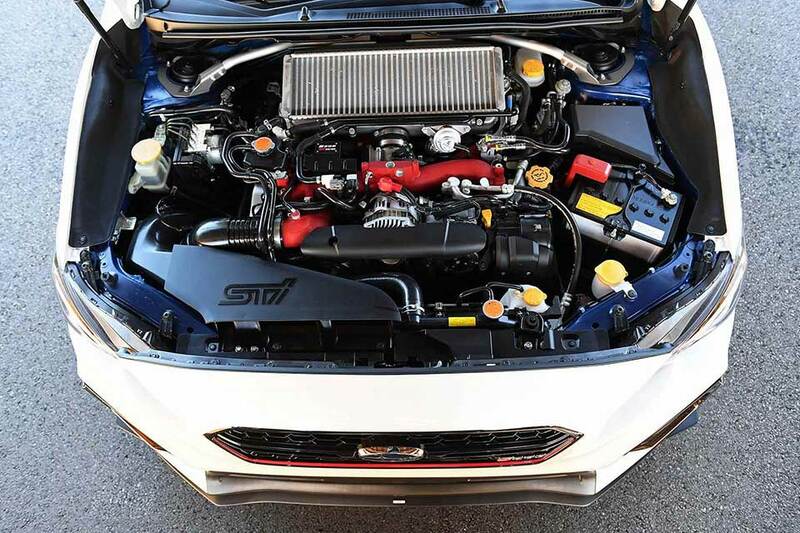 And then there is an STI-tuned engine control unit (ECU) and an intercooler water spray system to further aid in power boost. 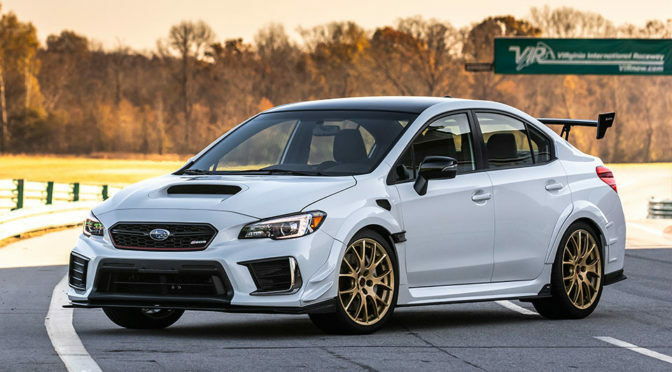 Other performance upgrades include forged pistons and connecting rods, STI-tuned Bilstein suspension setup, STI-designed BBS 19-inchx9.0J forged aluminum wheels, Dunlop 265/35R19 rubbers, STI-branded Brembo brake calipers (6-pod front, 2-pod rear), ventilated drilled disc rotors, stronger rate exhaust valve spring, performance clutch, high-flow fuel pump and injectors, performance shroud, Motul 5W-40 Performance Oil, engine solenoid bracket (with serial number), Vehicle Dynamic Control (VDC) system, Active Torque Vectoring system, STI short throw shifter, plus a bunch of STI-designed components. 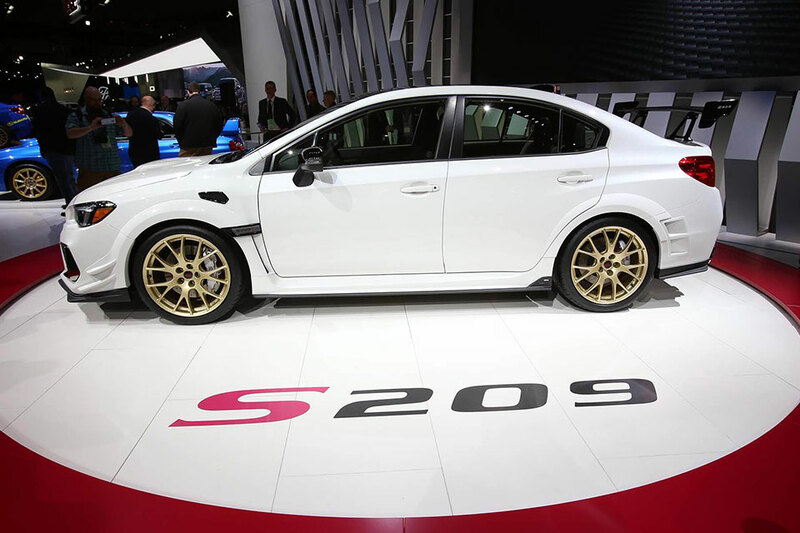 Further more, the S209 also gets some function and non-functional go-fast bits to distinguish itself from the lesser STI, including mesh-type front grill (cherry-red stripe with S209 ornament), STI underspoiler (front, side, and rear quarter), side bumper bezels in steel mesh and chrome plating, bumper side canards, flared fenders, front fender air outlet grill, side garnish with S209 logo, rear bumper (also cherry-red stop with air outlet grill), S209 rear ornament, dry carbon fiber roof, black door mirrors, and dry carbon fiber rear spoiler with S209 logo, naturally. Inside the cabin, it gets luminescent instrument panel with multi-information display and STI logo, stitched faux leather wrapped central instrument panel visor, Ultrasuede-wrapped steering wheel, STI-designed push start switch, STI-designed leather-wrapped shift knob and stitched shift boot, a six-speaker audio system with Starlink 7.0-inch multimedia audio system, shark fin-style black roof antenna, stitched heated Recaro front seats, stitched rear seats, decorative instrument panel, side sill plates, door arm rests, serial number plate on console, and sub trunk with tire repair kit – a common functional design feature in lieu of actual spare tire. 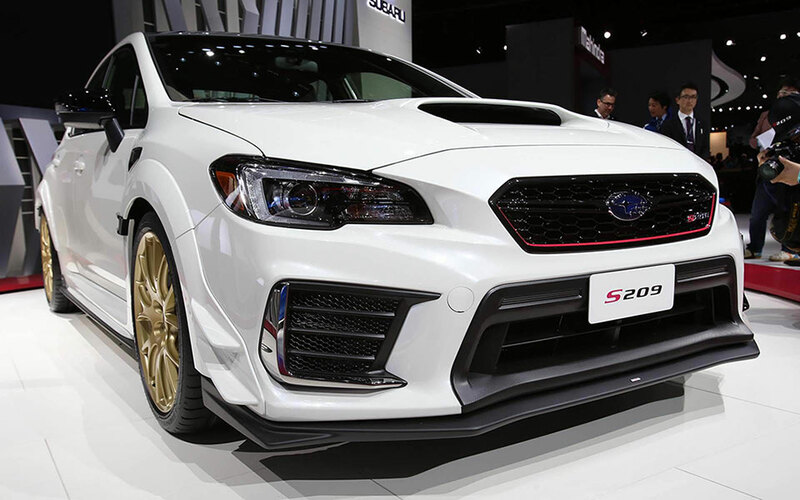 Subaru has brought the first-ever STI “S-line” performance vehicle for the U.S. market, and the most powerful STI-badged production model, to the North American International Auto Show. If you are there at NAIAS, you probably have seen it. 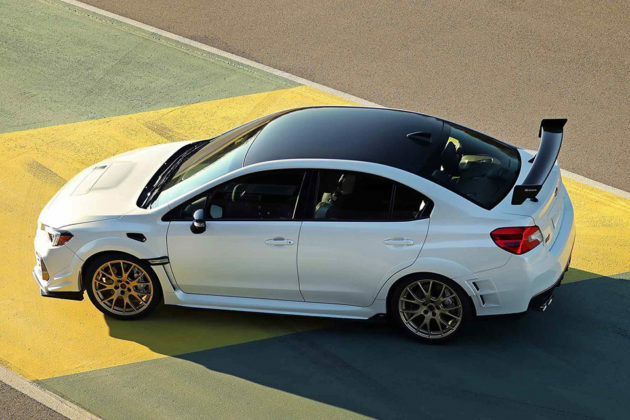 The Subaru Limited Edition STI S209 will be offered in two exterior color/BBS wheel combinations, namely, WR Blue Pearl/dark gray wheels and Crystal White Pearl/gold wheels, when it becomes available in late 2019 through U.S. Subaru dealers. Pricing, though, is not disclosed at this point. Meanwhile, keep going for a few more looks. 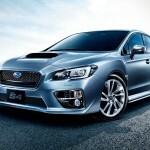 All images courtesy of Subaru.